I am finishing up this week with what this month’s chapter writer Seth called “the Trinity” readings. My experiences through Seth’s suggestions have helped me develop some clarity and understanding of what kind of spiritual practices speak to me. I must say though in these mere 30 days in which I’ve scrutinized these topics, I feel as if I have only scratched the surface wandering down the endless paths that examining religion and/or spirituality can take you. And where am I now after this month of March? Well I am no closer to any specific truth, and I may actually be further away. Which is A-OK in my book. In the search, between right and wrong, black and white, and good and evil, I have been finding large territories of gray landscapes, with unmarked highways, unnamed cities, and unspoken languages. But this does not deter me. On the contrary, it excites me. Being a lover and maker of black and white photographs, I spent years of my life in a darkroom trying to re-create the correct balance of black and white and all that lies in between by using a machine that directs and times the quantity of light. (sounds strangely like many of our searches for truth no?) I never made the same picture twice and gave up searching for any kind of perfect balance. I was happier with making what I called art. What I did find though in my darkroom explorations, is that no image is more beautiful and real than the ones that have a spectrum of gradations – a true white and a true black and the full gray-scale in between. How does this metaphor translate to my beliefs at the end of this month on spirituality? Well, I believe that the shades of gray (what it is we don’t know or can not prove) are the most important arenas to explore and examine, even if we are not sure what we are looking at? I can look outside of myself to a religious doctrine, a literary text, ancient manuscript or a scientific equation to prove what I believe to exist or to not exist. Or I can look within myself and observe my feelings, reactions, and instinct in my immediate environment to understand what I believe to exist at any given moment. Instead of trying to prove or disprove an existence of any God, I ‘d like to start by observing, accepting and being grateful for my existence and life itself. My last reading of the month is “Silence”: the Lectures and Writings by John Cage. In a strange way I feel as though Cage’s writings are depicting the same thing as the Tao Te Ching but only in literary and musical metaphors. I found Cage’s lectures to be a repetitive description of the constant process of construction and deconstruction of what we as a society understand to be “true”. It’s a way in which we have all learned throughout history to understand our place in the world. Flip to any one of the 276 pages of free form verse and prose in John Cage’s writings on Silence and find the same sentiments re-worded in ways that could engage all or any one of us. His words continuously question and dissect; they don’t define. Silence itself has been a reoccurring theme in my personal explorations into self-awareness and development. 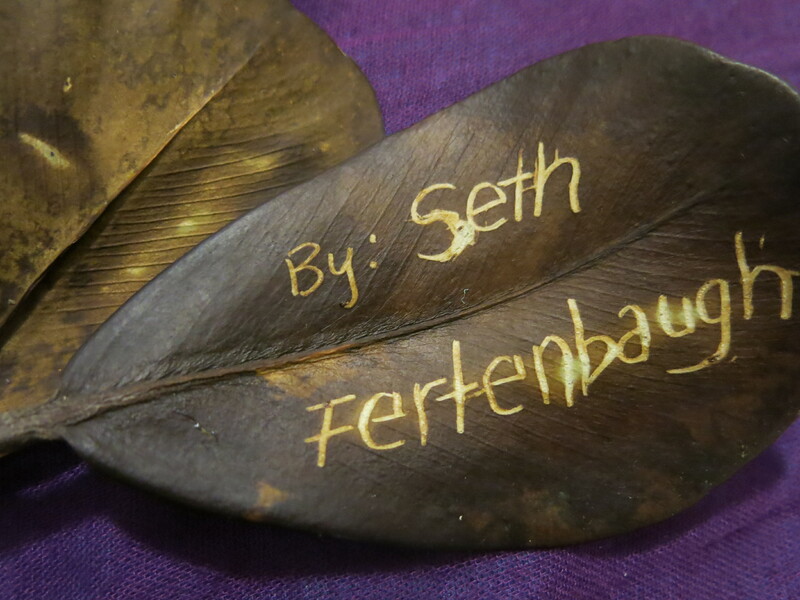 It is something that I would like to continue to return to and thank Seth for bringing it to my awareness in a new way this month. I believe that it is in the silence where the listening begins, not to other sounds or voices from the outside, but from the guidance that is held within us. It is there in the space that silence gives us where the process of construction and deconstruction occurs. 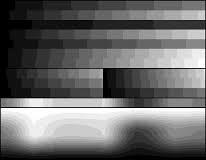 It is what depicts and fills in the full gray-scale and brings our own truth to life. But don’t listen to me. Find your own silence and your own truth. Where are you on the gray-scale? This entry was posted in Chapter nine, Protagonist Post, Uncategorized and tagged Black and white photography, John Cage Silence, Religion and Spirituality, seeking personal truth, silence, the gray-scale on March 30, 2014 by Beth Barbush. So I have been spending A LOT of time this month engaged in independent introspection through my own meditation practices, in my readings and in reflection writing sessions in response to the readings Seth has assigned. I enjoyed my alone time greatly but was open to testing out the shared experience of a community spiritual gathering. I was asked to participate in at least one religious or spiritual service this month. I was happy that I was able to participate in two. The two were very different in their own right and I feel as if I could have written a blog post on each as I had very different experiences and feelings about each of them, but as Seth mentioned in his initial chapter challenge this month he wanted this chapter “to be to be more internally reflective and self-examining.” My descriptions of both events will inevitably leave out some details as I am still examining my reactions to both experiences and may be able to write more about them at another time. Here and now, I will leave you with my initial observations – excuse the lengthy post. Both experiences were intense and full; I thought some readers might find interest in the comparison. 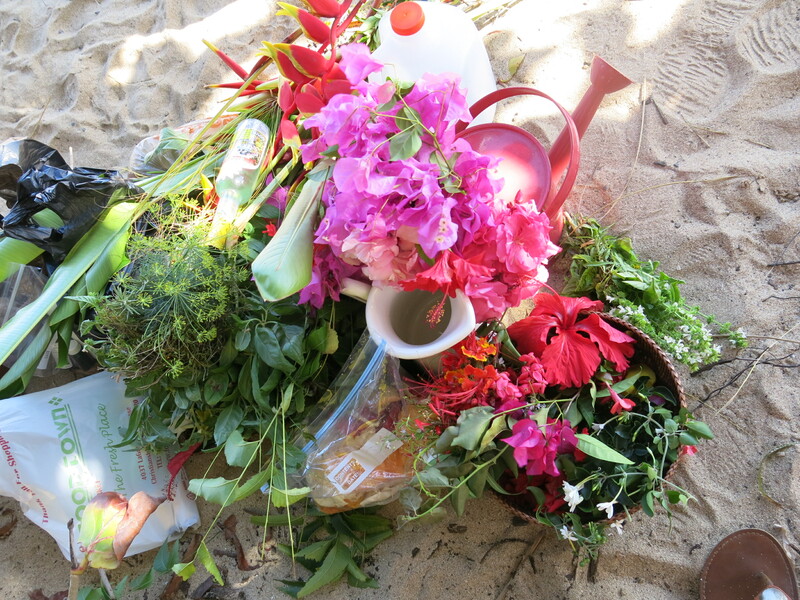 The day before I left St. Croix I attended a gathering called a Women’s Bush Bath. I knew very little about what this process was, how it would unfold or what it was exactly for. But it sounded like a wonderful process to be a part of and a great way to say goodbye to the island for a few months. The event itself happens from time to time throughout the year and is organized by one or more women who decide to initiate it. This particular one took place on a full moon Sunday morning. I was invited by a new friend on the island and was told to come only with herbs, flowers and an open mind. Oh and to wear a bathing suit. The gathering was held on a beach on the East end of the island looking out to America’s only underwater national park – Buck Island. The beach was virtually empty outside of the group of about 20 women who attended. There was a very open and organic structure to the gathering, but from beginning to end it lasted about an hour and a half. Women arrived with bags of wild flowers and herbs (sage, rosemary, thyme). Each woman greeted each other warmly as they arrived and laid out their beach towels in a circle around several buckets of fresh water. The organizer reminded us as we sat down in the circle to engage with those that we did not know (someone of a different age or a different race, someone from the island or a visitor) We were then asked to prepare the bath. Each woman from the age of about 6 – 66 was asked to distribute the flowers and herbs into the waters. 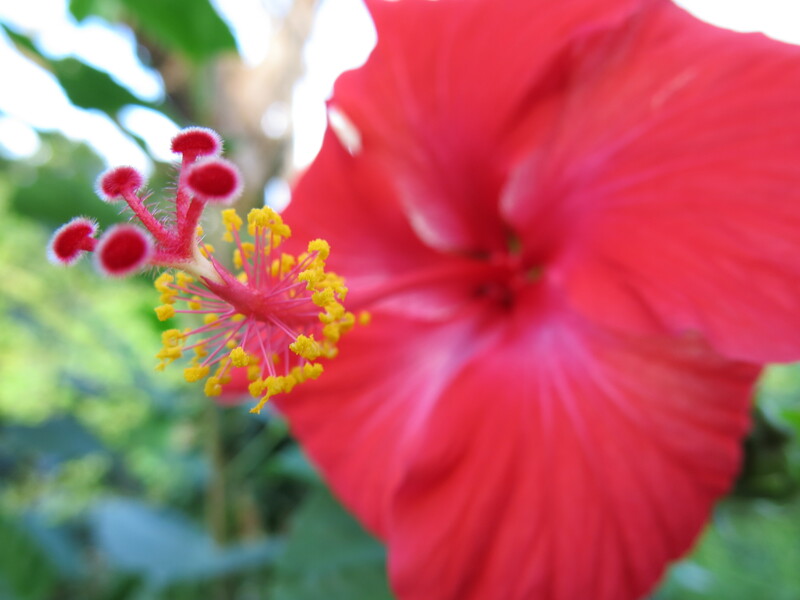 Each of us took our turns scattering and dunking the bright red hibiscus, the orange and pink bougainvillea and rose petals, along with a myriad of other wild tropical blossoms into the buckets of fresh water. We were asked to put our positive intentions for ourselves and others into the water with the flowers and then take a short walk away from the circle for a personal moment of contemplation. We were asked to conjure all that is not serving us anymore – look at it directly and let it go. Upon our return to the circle a few prayers of gratitude and intentions were said over the water. Each of us were asked to call on a maternal figure from our ancestry to bring support to the circle and prayers of gratitude were spoken. Each person was asked to focus on their special skill or purpose (a word or an idea that they felt they were able to give to the world) We all spoke that word into the circle then one by one were bathed. Starting with the youngest and then the eldest in attendance, each woman took a turn dunking coconut shells, and flower pots into the water showering the (now warmed by the sun) fragrant mixture of herbs and flowers over the heads, arms, and bodies of each participant. After being bathed, each person bathed the next woman in line. Following the cleansing we formed a line by the sea’s edge and took in the view of the island in the distance, the sound of the crashing waves and the chants of one woman singing. When all had completed the bath we brought the line into a circle and said our goodbyes to one another. Exactly one week after the Bush Bath, I attended a very different spiritual gathering. In an effort to understand or reconnect with my childhood Catholic rearing, I returned to the Catholic Church that I attended as a small child. I had not been to a mass for at least 15 years and had not been to this particular church in 25 years. Although I have rejected the teachings of the Catholic beliefs and the structure and formalism of the religious practice, there were few things about the process that I still remembered to be comforting. My Grandfather played the organ each Sunday and the colored stained glass windows glowed with light from outside in the dark building. I wanted to see if there was still some comfort there to share in. It was a cold wintry morning (yet technically a few days past the first day of Spring) Even inside the church I found myself still shivering. I sat in the back and watched as the pews filled up with people quietly filing in. There were a few kids squirming sitting in a separated section of the church reserved for them and 3 men dressed in long white robes overseeing the service on a raised stage in the front of the room. The wall held a large golden-colored cross with the figure of Christ nailed to a cross. The colored windows that I remembered were now dampened by new blinds that looked strangely like bars on the windows. The service started out with a reminder and request to focus on the sins that we have all committed throughout the week. “Remember what you have done and confess your true nature” were the words of the preacher. This was followed by a story of Moses and a lesson about what love is to each of us and what is should not be. We were asked to face our truths but only in an “appropriate” context. After this homily, we were reminded to donate to the church and asked to volunteer in the telemarketing plea for donations for the church. The upcoming Easter services were also mentioned (there would be an egg hunt following mass on Easter Sunday). This was preceded the basket passing for church donations. The blessing of the gifts were then made and the body and blood of Christ were consumed shortly after by the congregation – communion. In between homily and donation requests the congregation stood up, sat down, kneeled and prayed intermittently. Songs were read and sung from the prayer books and prayers were repeated in unison after the preacher had recited them. The final message passed on before leaving was about how following the “lamb of god” would take your sins away. “Let us leave you with the mystery of faith.” We gave our handshakes of peace, there was another hymn played and I left the Catholic Church for the last time as the bells were ringing in my ears. Want to know more about Catholic “Mass?” Check this out and learn more if you have not been to one. Interested in Catholic Services in Harrisburg Pa investigate for yourself. This entry was posted in Chapter nine, Protagonist Post, Uncategorized and tagged Bush Bath, Catholic Mass, communal spiritual gatherings, Harrisburg PA, Religion and Spirituality, St. Croix on March 28, 2014 by Beth Barbush. In reading Beth’s entries this month in response to my challenge, I found her story was very similar to mine. I also went through the motions of CCD and Mass, which I found largely uninteresting. I also played mental games to occupy myself during services waiting for the last Amen so I could be released into the room at the back of the church where my brother and I would rush hoping there were donuts and orange juice left. (The bribe of juice and donuts seems to be a common one.) My reaction to losing my Sunday mornings and Wednesday evening to the Church for much of my childhood was not just to reject Christianity but also to spend the proceeding years attempting to understand why religion in general did not work for me, and subsequently, to figure out what did. This, in so many words, was the primary goal of the task I set forth for Beth in this month’s chapter: To interact with diverse spiritual experiences, and through thoughtful reflection, come closer to understanding one’s own beliefs. As I told Beth at one point during the month when she seemed to be struggling with reading the Bible, my intention for this chapter was to actually read these ancient religious texts which not many people have done even though they may be familiar with the stories, and to interact and reflect on these texts and the profound affect they have had on us and our culture. Even if we feel these ancient documents do not directly affect our lives, they do have an enormous impact on how a lot of people perceive the world. They are a record of the hopes and anxieties of our ancestors and the mythology they created to deal with their world. This entry was posted in Chapter nine, Uncategorized, Writer Comment and tagged Religion and Spirituality, understanding ones own beliefs on March 25, 2014 by Beth Barbush. Around the same time I was struggling in my CCD bible study classes (around age ten) I was excelling in elementary school. I enjoyed learning and loved the subjects in particular in which my teachers created open and welcoming environments to grow and learn in (specifically Art, Reading, English, and Social Studies). In 5th grade I remember doing a report on Taoism (my first ever exploration in comparative religion and philosophy). At that age, and still today, I found Eastern Philosophy to be fascinating. Everything about it was enticing, the foreign names, pronunciations, symbols and images and even the geography of the continent of Asia intrigued me. 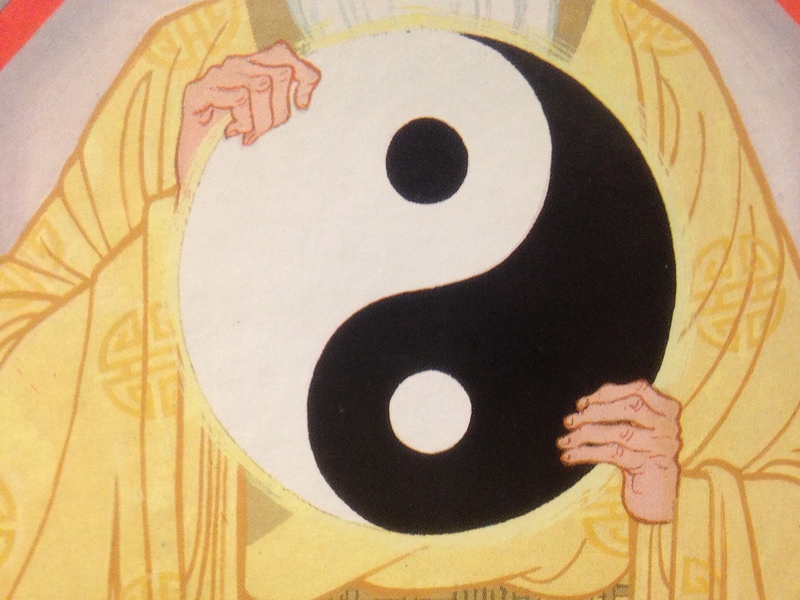 Studying Taoism then may have opened a window to a new world of possibilities. At that point I had been influenced only by the beliefs of my parents and perspectives of a very small group of similar minded people in South Central Pennsylvania. I remember reading voraciously trying to soak up as much information about this other universe that I could. I always came away from my readings slightly confused and mostly baffled but in a satiated way as if I had consumed a very delicious meal that I didn’t know any of the ingredients to. How or why did it taste so good to me or make me feel so full? I guess, I blamed the confusion on my youthful brain for not entirely comprehending the philosophy but after reading the same text almost 20 years later I am having the same sensations. mmm….what was that? Oooh that sure was tasty! Can I have some more please? After digging through the Bible’s dense teachings and trying to translate meaning from metaphor and myth, I found this week’s reading, the Tao Te Ching, to be refreshing – thirst quenching to be precise. In one short airplane flight last week , I sucked it down like a fruit smoothie quickly, but did not get a brain freeze in the process. Like the Bible, I left the text’s pages with many unanswered questions and a lack of clear understanding. However, in the case of the Tao, I am much happier for it and have realized that the not knowing is fine. In fact it is important if not more important than the knowing itself. To me this is one of the essential messages coming through in this text. If there is a lesson to be learned, it is the nature of constant questioning and contradiction. This lesson can be found on the very first page. The nameless is the origin of heaven and earth. I believe there is a shared intention that we all hold (if we are honest with ourselves) in the seeking of these ideas, answers, and tools that binds even the most opposed characters together in a way that is difficult to deny. It’s in the naming of things, the act of possession, and our righteousness only that makes us believe and feel that we are separate and different from one another. We really are the same. The intro of the Tao Te Ching describes this notion. “those who claim to know the Way, who claim to be able to categorize it relative to other named entities, are ignorant of its true greatness – and thus their attempts to realize the truth will be frustrated and futile”. And the teaching of this lesson through Lao Tzu’s words is done in a way that embodies this message. There is no judging of what is right or wrong only a subtle nudging and request to be aware of the path itself and of others on the path along the way with you. I highly recommend the experience of reading the Tao Te Ching yourself. You may glean other messages that will help guide you along your way. Below are some excerpts that revealed lessons that feel important to me. And so you have the beginning of division of names. I do not force my way and the people transform themselves. This entry was posted in Chapter nine and tagged Lao Tzu, Religion and Spirituality, Tao Te Ching, Taoism, The Way, yin-yang symbol on March 23, 2014 by Beth Barbush. Hi Beth! We are excited to be part of this month’s Living Chapter focusing on spirituality/existential. As you comb through sacred texts and reflect on your religious self, we want to add to the meditative component of this month’s chapter. 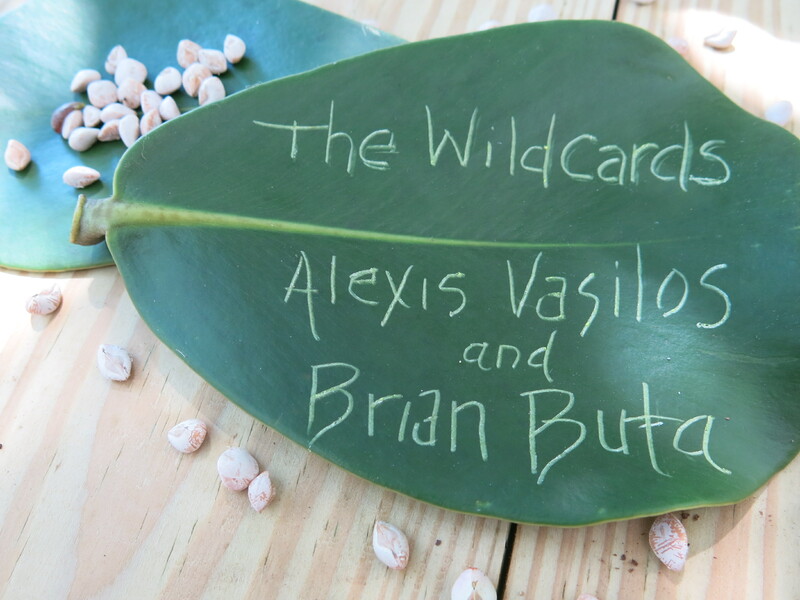 During Alexis’ yoga teacher training a couple years, she learned about chanting as a way to lead-in to meditation. Chanting is recognized as a spiritual practice in many religions, and we hope it will add to your reflective experience for the rest of the month. So the Wild Card is quite simple: for at least one of your twice-daily meditations, start with chanting for a couple minutes. You can increase your chanting time as you like. Chants can take many forms and you can use any phrase or mantra you like. Perhaps a line from one the texts you’ve read, or a meaningful song lyric, or even just a single calming word. For your reference, we’ve recorded some examples of chants that we like. These have even come in handy for calming our baby! We hope they have the same effect for you. As you build chanting into your meditative practice, try to focus on your breathing and allow the chant to serve as an aural broom, sweeping away any thoughts and worries. We think that sound can serve a unique role in spiritual reflection and we hope it brings additional clarification and calming to your day. This entry was posted in Chapter nine, Uncategorized, Wild Card Post and tagged Meditation practice, Religion and Spirituality on March 16, 2014 by Beth Barbush. 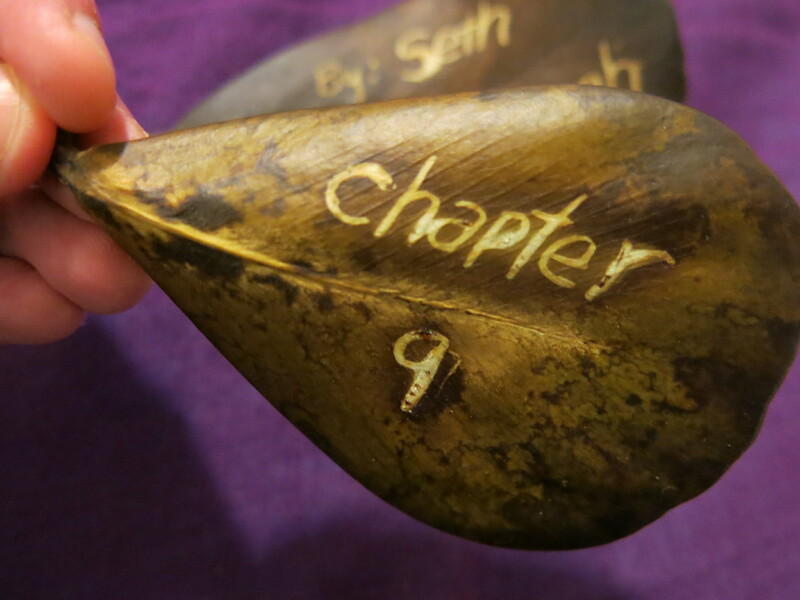 Like this month’s chapter writer Seth, I was taught the Catholic faith growing up. (well partially). I say partially because my parents were divorced and I was only exposed to Catholic teachings when visiting my father and Italian grandparents on the weekends. Conveniently our visits coincided on Sundays, which meant I spent 50% of my Sundays during childhood in a Catholic Church and/or Sunday bible study classes called CCD. When it became my choice if I wanted to attend these rituals or not, I stopped attending both by the time I was 13. I am 37 now and have participated in little to zero other organized religious services or gatherings outside of weddings and funerals. Reading the Bible this month, although strange to me, may actually come at a perfect time. As I said in my previous post, my own spiritual growth and exploration has had plenty of time and space to grow in the past six months. I started a meditation practice back in September guided by my first existential chapter writer and have continued the practice at my own pace and with my own agenda. 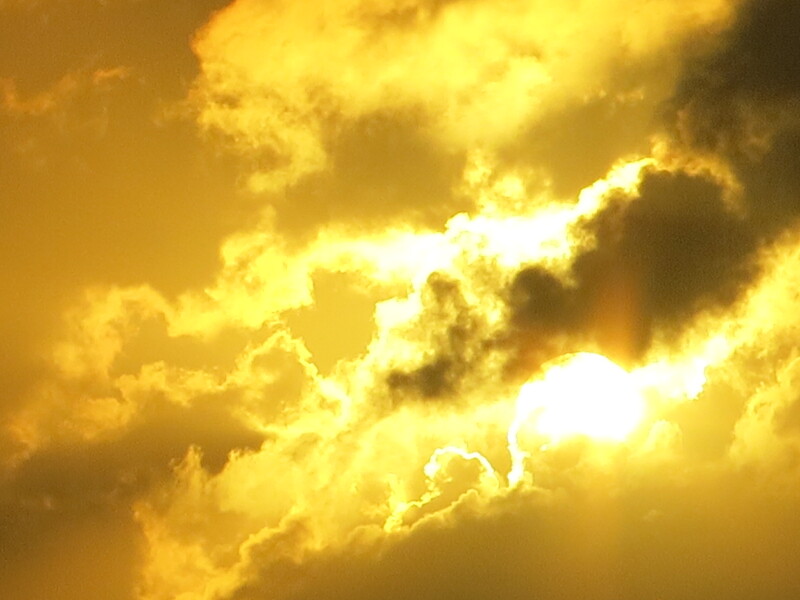 Here in St. Croix, I have had even more time in a very surreal and existential setting to ponder even more my connections to the environment and the people around me (Chapter 7 and Chapter 8). Thinking about the connections between it all inevitably has led me back to the overall existential questions about God and faith. But I must admit, even just picking up the physical book “The HOLY BIBLE” is giving me flashbacks of being a kid and dreading the oddness and confinement that I felt when attending Sunday mass. The one thing I probably do agree with from my Catholic teachings is that confessing or being honest about things you’ve been hiding, or holding back can sometimes feel really refreshing. (As long as it is NOT in a small dark closet and to a stranger behind a wooden wall! That is just scarring not sin-relieving) So with my Catholic background in mind let’s start out this month with my top 10 confessions(in no particular order) about my religious experiences now and then. 2) My father had to bribe me with Dunkin Donuts munchkins to sit still in church – this was the real motivation behind my good behavior during church. 3) My brother and I spent our time in Sunday mass gambling. We would bet each other our allowance money on guessing pre-sermon how many times the preacher would say Jesus, Christ, or Holy Spirit. The closest who did not go over won the bet. This took our mind off of the echoing booming voice of the preacher and the somber and serious expressions on everyone’ face in the congregation. 4) I never (until now I just looked it up) knew what my “CCD” class name stood for. Now I know and it creeps me out a bit. Check it out here if you are curious too. 6) Getting communion freaked me out. I cannot remember how old I was when I had my first communion (ceremony and all). But I do remember having to wear an awful white dress and crying the entire service. I avoided taking communion in mass thereafter like a 4-year-old would avoid eating vegetables. Somehow eating the body and blood of Christ was never appealing to me. 7) The most religious experience my mother introduced me to was the album “Jesus Christ Superstar” My brother and I at age 8 and 12 memorized the words to these songs and ran around singing happily to this record. I saw the film much later in high school. It did not bring me back to the church but gave me a greater respect for the stories that going to Sunday Mass had turned me off to. 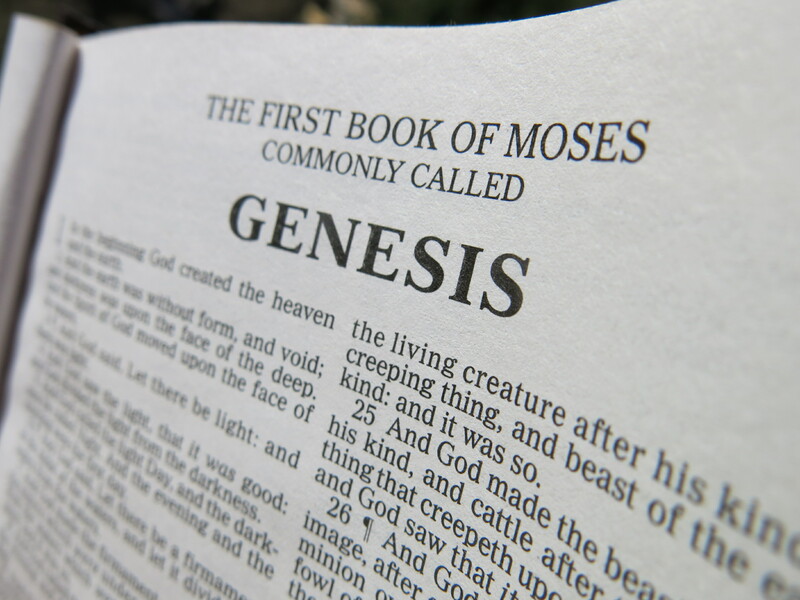 10) And last but not least, I procrastinated this weeks task of reading the first 11 chapters of Genesis through. I just sat down and read it (did it twice actually). And somehow I still don’t really understand it fully. Do I need to relive my CCD classes? Maybe I need to read the chapters through at least once more with a few more chapters for context? I know that these are ancient stories to help us come closer to translating the genesis of the earth and our lives but am finding it hard to translate to our current times. I am grasping little in this right now that relates to or adds to my already strong sense of personal faith, and guidance that I believe is necessary to move through the world. I will however remain open and will read further. There is always something to gain from processing how others around you navigate the world. Like the moth to the fire. The flame can lead the moth to a blinding enlightening experience or it can lead to a fiery end . If we are alert and make our own decisions there is nothing wrong with following our own path to knowledge. This entry was posted in Chapter nine, Protagonist Post, Uncategorized and tagged Catholic upbringing, CCD classes, Genesis, Religion and Spirituality, top ten catholic confessions on March 7, 2014 by Beth Barbush. That being said, why would I volunteer to participate in the chapter on spirituality? Despite my lack of belief in all things supernatural, religion and other manifestations of spirituality have always been a topic of interest for me. One aspect of religion that I consider important to the development of a person (though it is not the exclusive dominion of religion) is quiet meditative introspection (i.e. prayer). That is not to say that community is not as important, but whereas prior chapters (September excluded) have been more outwardly expressive, I wanted this chapter on spirituality to be more internally reflective and self-examining. Reflection through study: I’ve provided a selection of religious texts for you to read to provide you with a diverse though extremely limited introduction to religion and how people of a spiritual worldview translate their feelings into words. Even though this is not a comprehensive survey of world religious texts, I’ve tried to represent both Western and Eastern religious traditions and I think these are all important texts to read. (I encourage you to read further.) Write and reflect on what you are reading. *A note on my selection of texts: In regards to the biblical readings, excluding the Christ story, Genesis and Revelations are, in my opinion, the two most influential Books of the Bible. The Tao Te Ching is the most important text of Taoism and espouses an interesting theme of action through inaction. I chose John Cage to represent Buddhism, not because I couldn’t find a sufficient Buddhist text, but because I thought you might find it interesting to reflect on how an artist (musician) whose life and music was thoroughly influenced by Buddhism translated his spirituality into thoughts and words. I also encourage you to listen to his works to capture the full experience. Reflection through participation: And so as not to make this chapter a completely introspective task, here is the community element. Community building and cohesiveness is an important aspect of religion, so your task is to attend one religious service this month. It can be a Catholic Mass or a Wiccan ceremony, whatever is available to you, and if possible speak to the participants about their spiritual experience. I hope whatever you cull from this month’s chapter (and this project in general) that it serves you moving beyond Living Chapters. Despite my own beliefs, I think there are wellsprings of creative and mollifying resources in daily introspective reflection. I don’t feel this type of mediation needs a supernatural or religious structure to be beneficial to an individual, but that is a path each person has to navigate for themselves. As Lao Tzu wrote, “A journey of a thousand miles begins with a single step.” Hopefully, this experience and this project will be an important step in that journey. 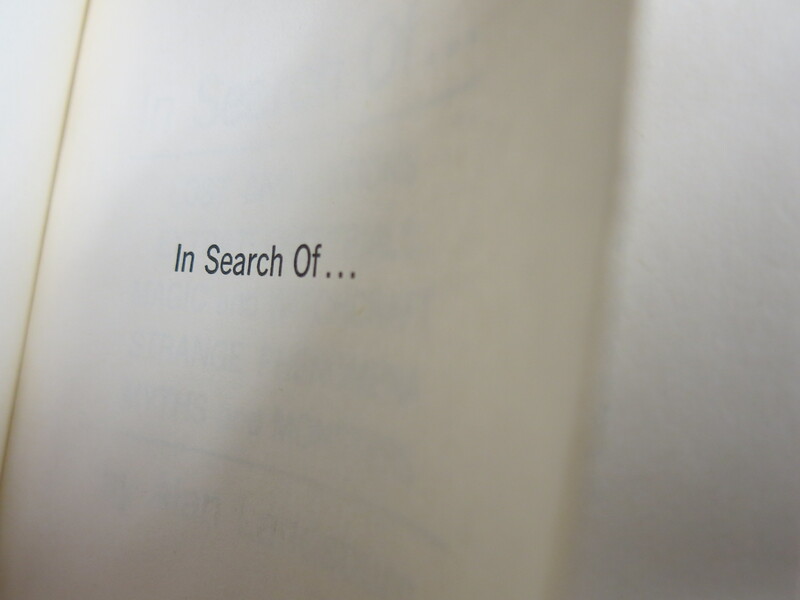 This entry was posted in Chapter nine, New Chapter, Uncategorized and tagged Existential, Meditation practice, Religion and Spirituality on March 1, 2014 by Beth Barbush.